Levolor Accordia Designer Colors Single Cellular Honeycomb Shades for room darkening are for those serious about residential energy efficiency and insulating their home’s windows. Available in color classics and 9/16” cell, integrated technology maximizes the insulation properties and provides you with the ultimate in privacy. No more afternoon sun baking through your bay window and drafty windows are a thing of the past. 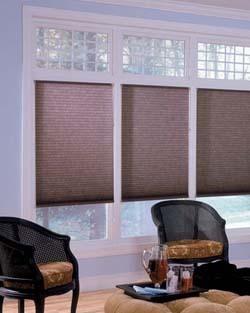 The insulation quality of our room darkening cellular shades - paired with the soft fabric look gives this cellular shade an innovative design that will surpass all your expectations. Levolor valances and headrails compliment all Accordia Shade collections by matching colors and styles for the perfect finishing touch. Continuous Cord Loop This is a continuous cord loop operating system. The cord loop is pulled in a circular motion to raise or lower the shade. If width is greater than 120", maximum length 96". If width is less than 30", maximum height is 96". Continuous Cordloop - if width is greater than 120", maximum length 96". If width is less than 30", maximum height is 96".